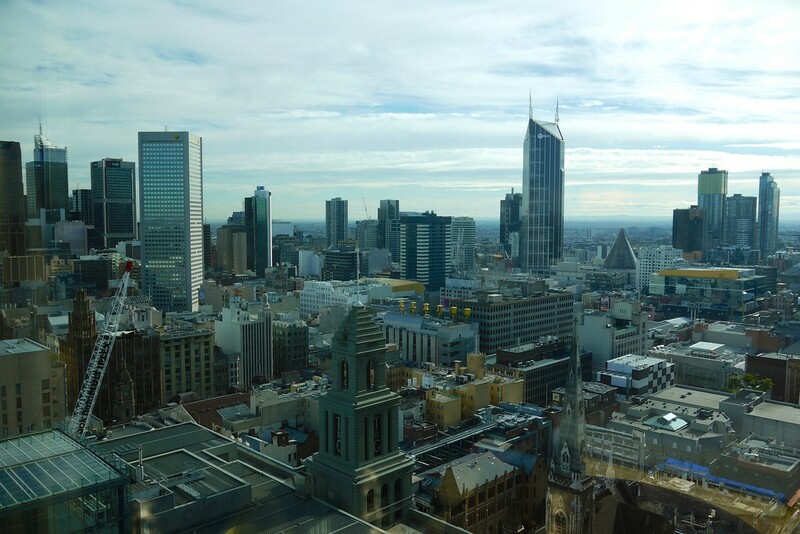 A couple of months back I was in Melbourne, close to the Grand Hyatt and with a couple of hours to spare. 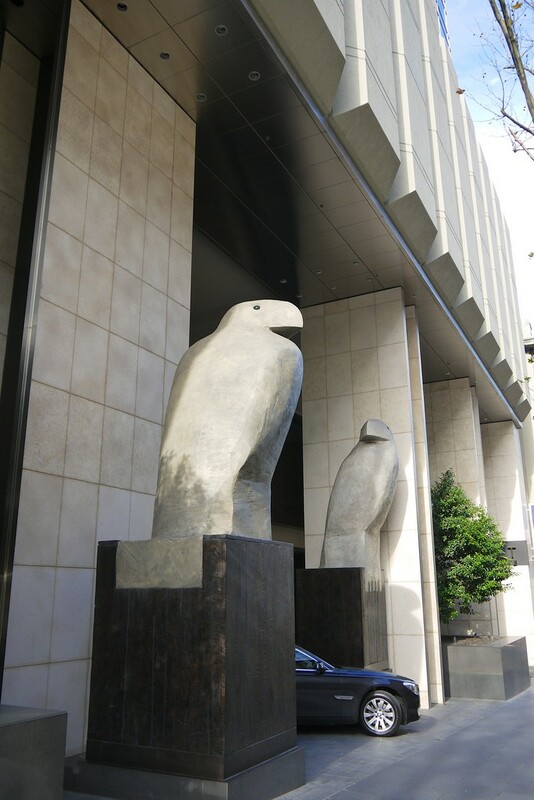 The grand eagle statues on Collins Street in the CBD have often intrigued me, and via their friendly marketing team I arranged a brief tour of the hotel so if you’re considering a stay there you can get a feel for the place. 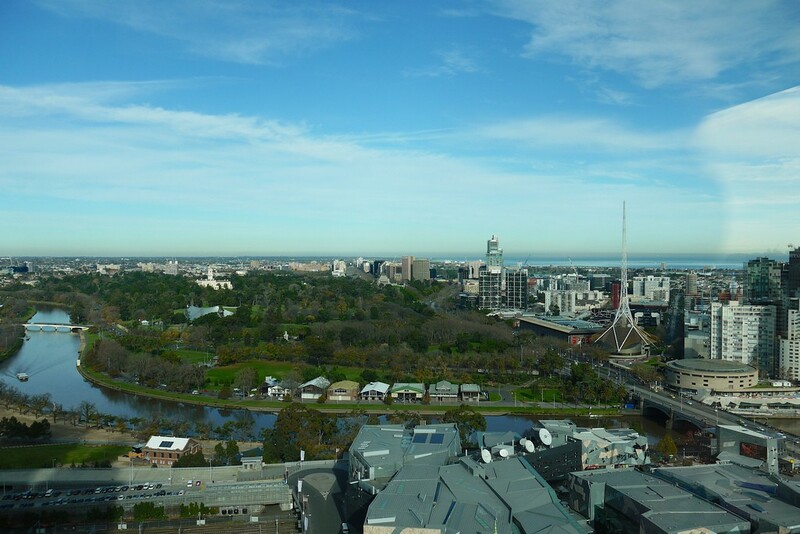 It’s not a review, just some photos interspersed with my comments. 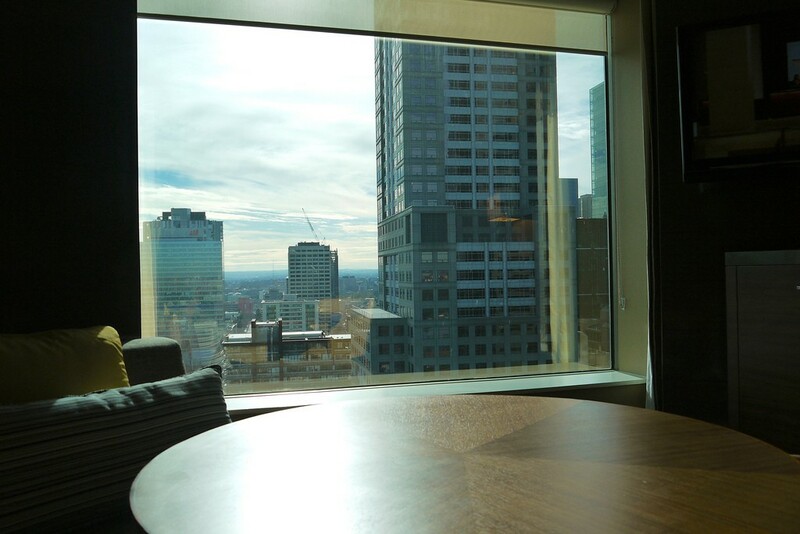 The Grand Hyatt Melbourne is located on Collins and Russell Streets, right in the heart of the CBD. 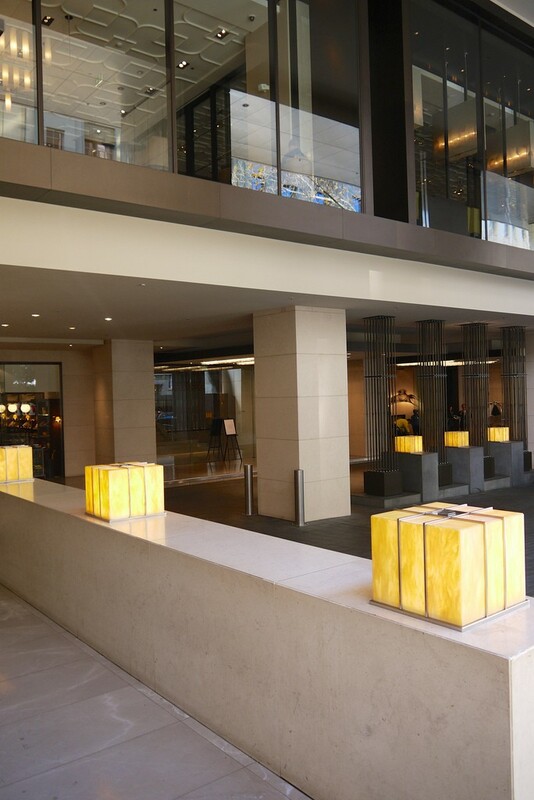 The entrance is pretty unmissable on Russell Street, with the vast eagle (or similar!) 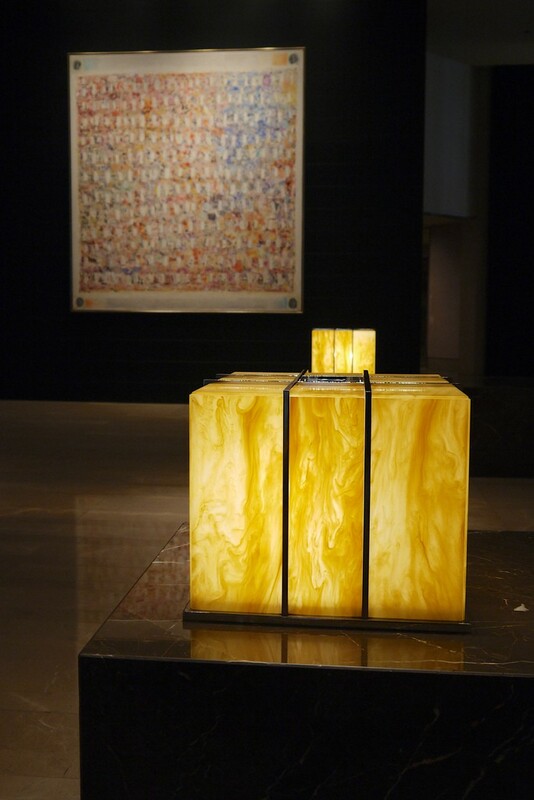 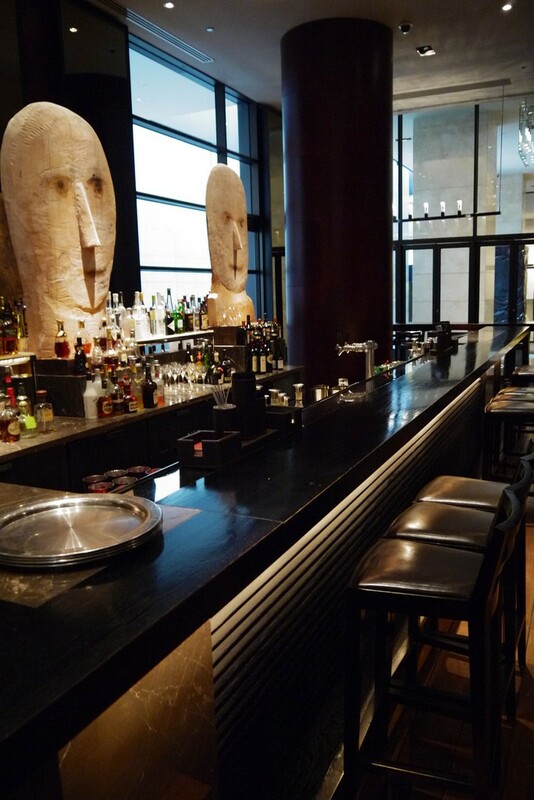 sculptures facing outwards. 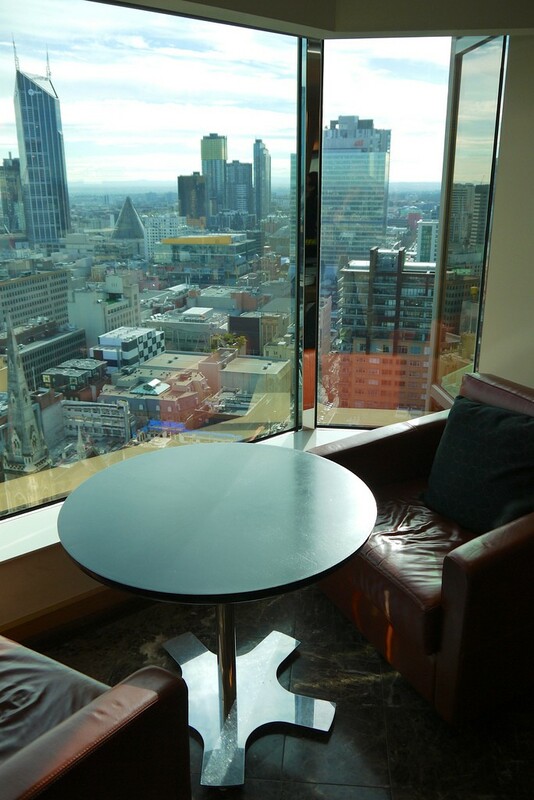 The eagles are pretty impressive, and welcome you to the lobby on the first floor lobby above Collins Street, where you’ll find the Collins Kitchen restaurant and RU-CO bar. 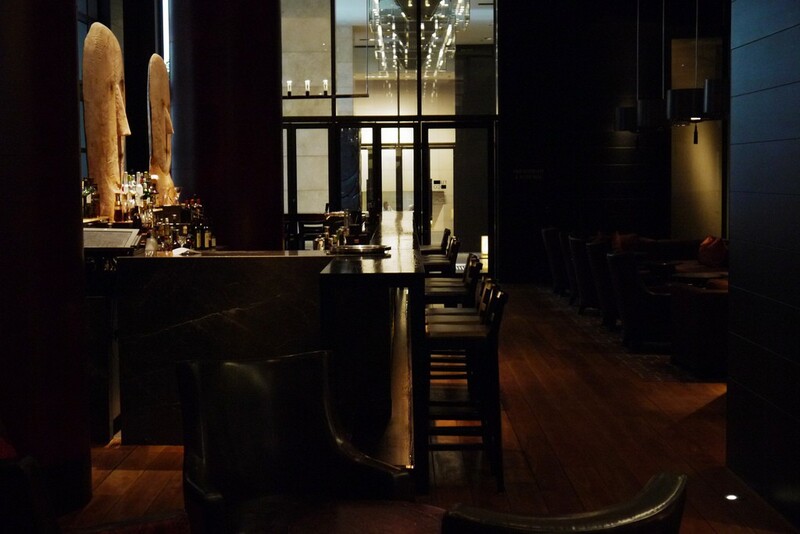 The lobby is pretty highly trafficked, and not a place to spend much time unless you retreat to the Lobby Lounge cafe, bar or restaurant areas. 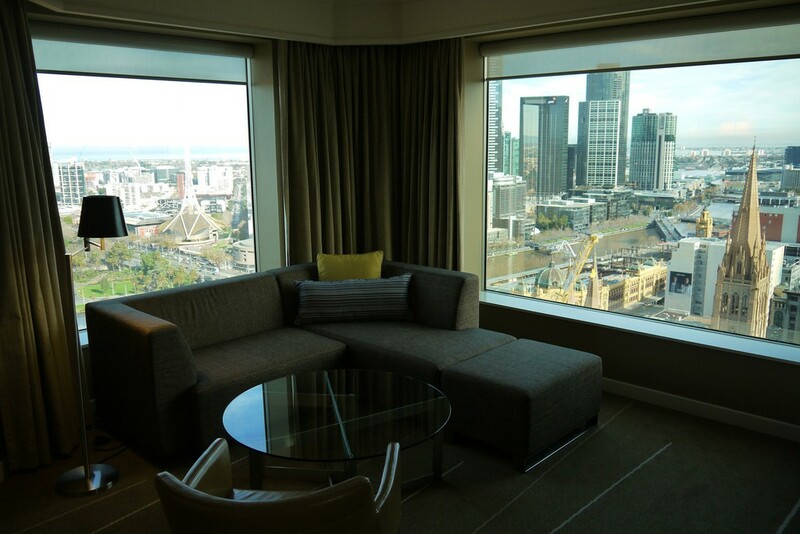 I was taken up to a Grand King room first, the cheapest room type. 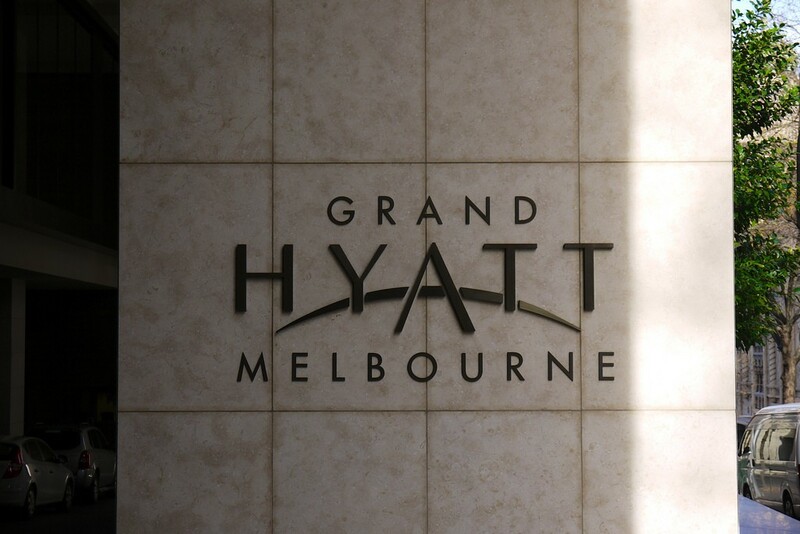 The overall design aesthetic of the Grand Hyatt is pretty much exactly what I appreciate – modern, but comfortable and understated. 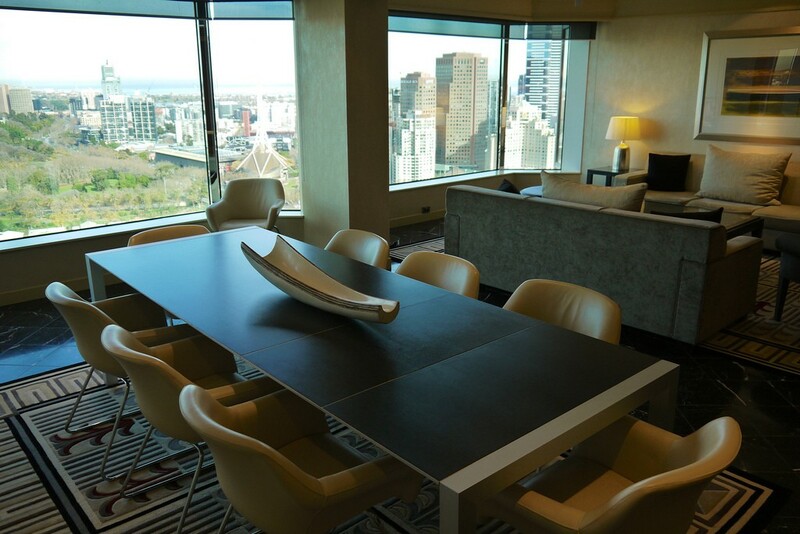 The ‘proper’ table, leather chairs and lounger is a nice touch, rather than a desk and token single chair. 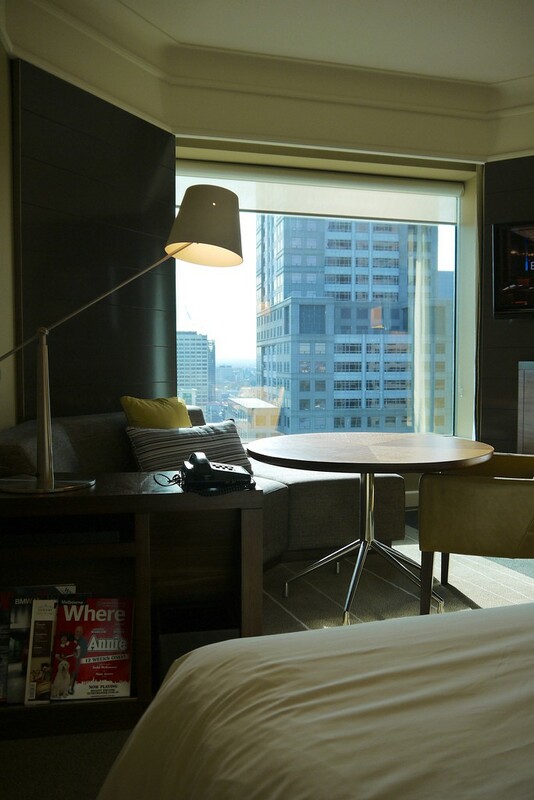 Ever felt kind of weird eating room service at a desk? 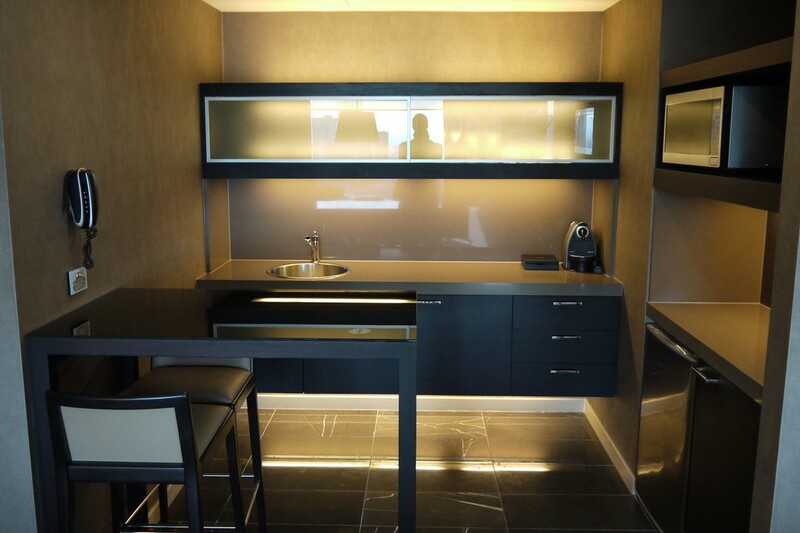 This would be much nicer -the room felt much more homely and I can see how the table can serve multiple purposes. 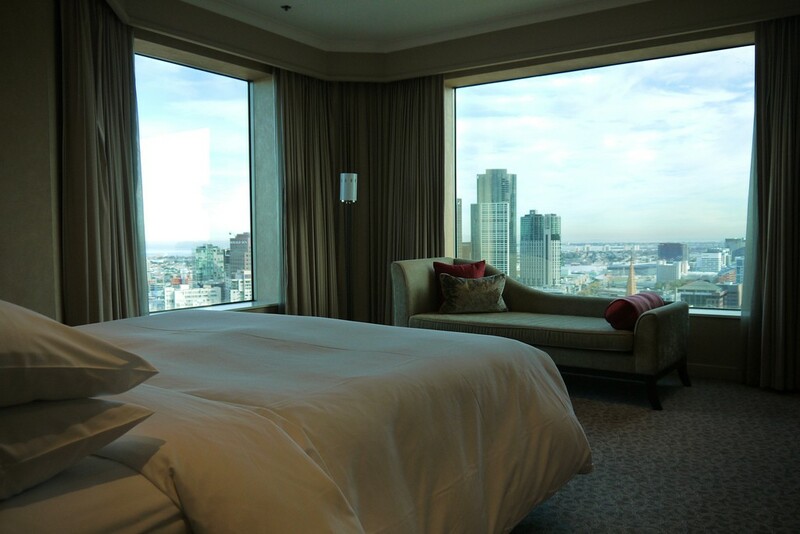 The room wasn’t huge, but no more compact than entry level rooms at other Melbourne hotels I’ve stayed in, nicely furnished and well laid out, commanding a great view of the city from most locations. 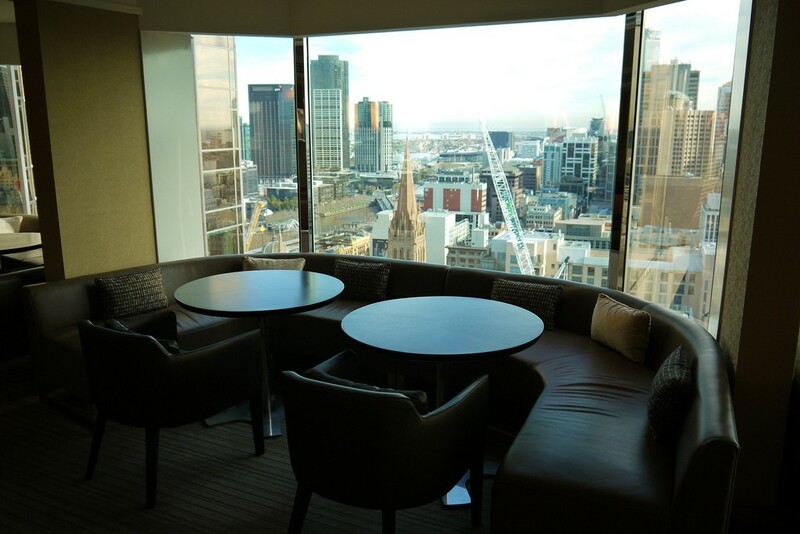 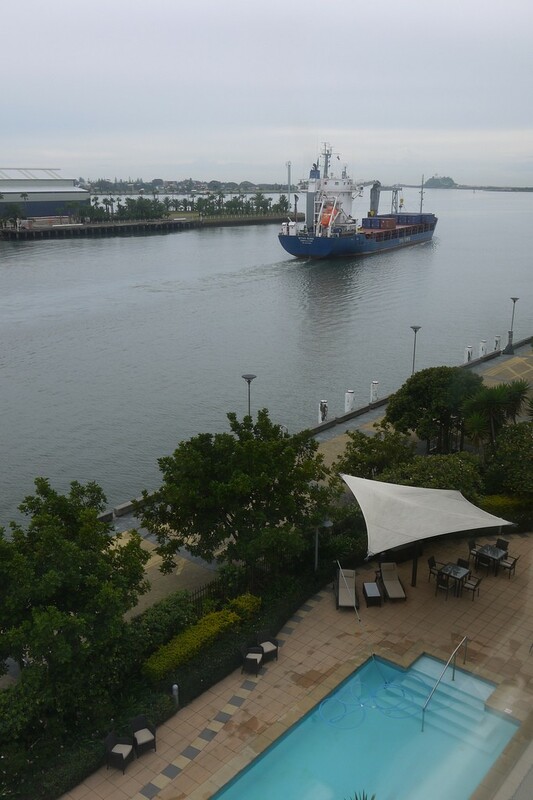 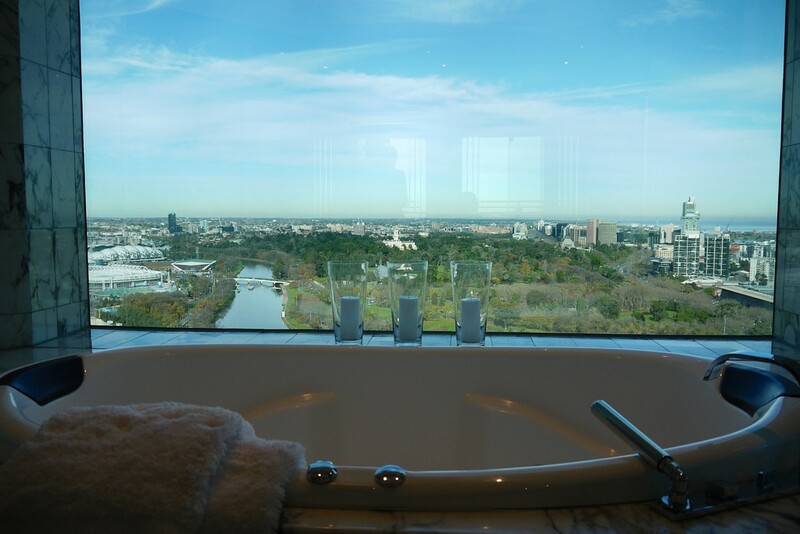 There’s also a Grand View room type, higher up in the building with better views of the Yarra River and City, Club King/Twin rooms on the top four floors, all of which have access to the Grand Club lounge, and Spa King Rooms which are larger still, and with a spa tub in the bathroom. 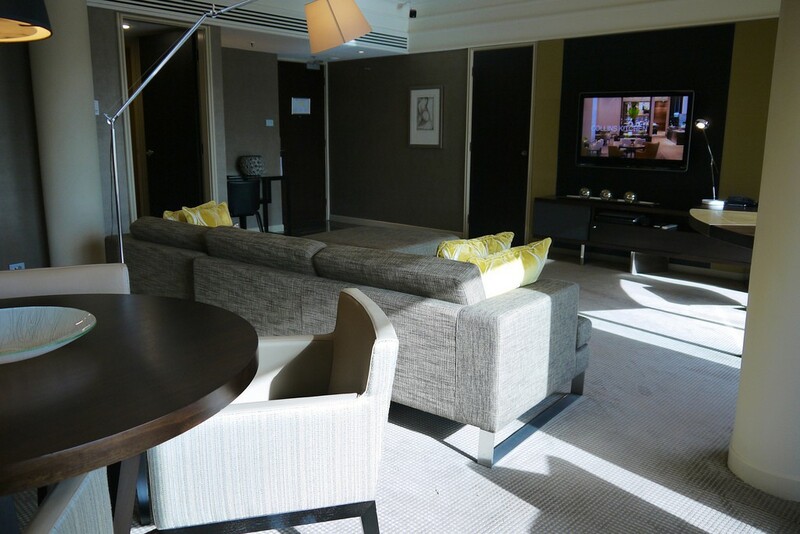 The Grand Suite is the lowest room type with a fully separate bedroom and lounge room, and guests have access to the Club Lounge also. 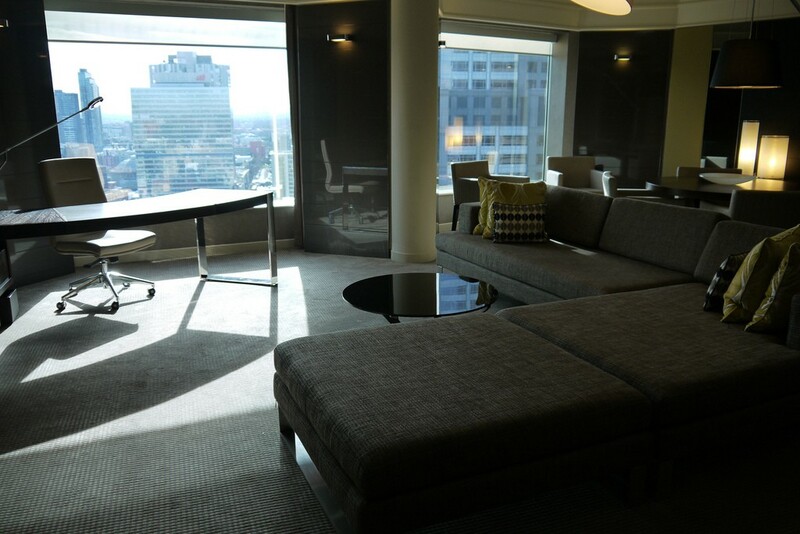 Grand Executive Suites are also available with a larger dining room, separate kitchenette and again, Club Lounge access. 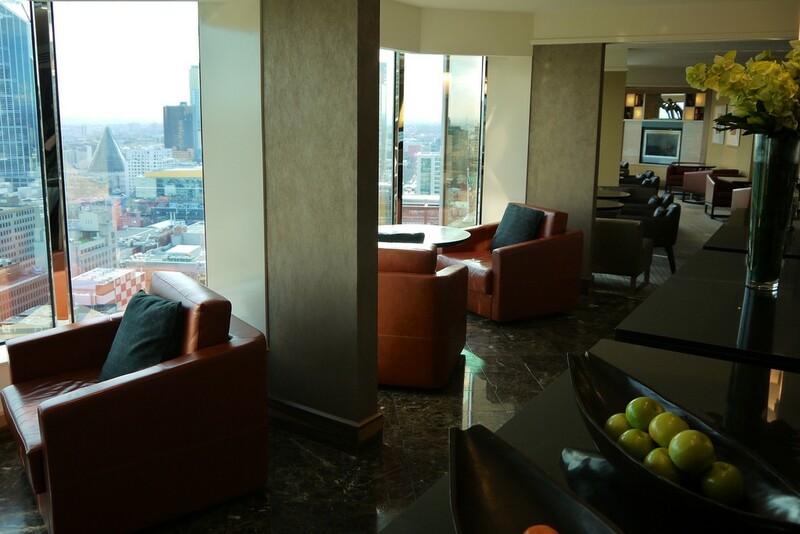 Ambassador suites are large suites with an open-plan lounge and dining area. 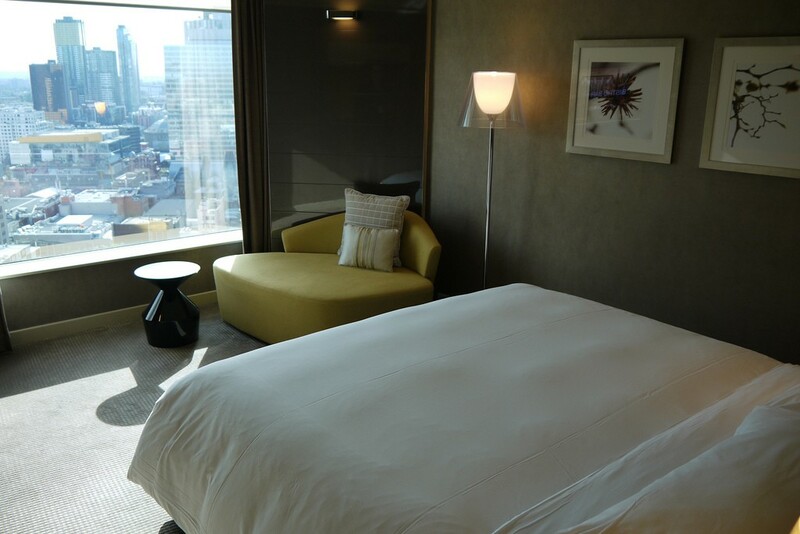 On the top floors of the hotel there’s a separate bedroom, kitchenette, Club access (of course, and stunning city views). 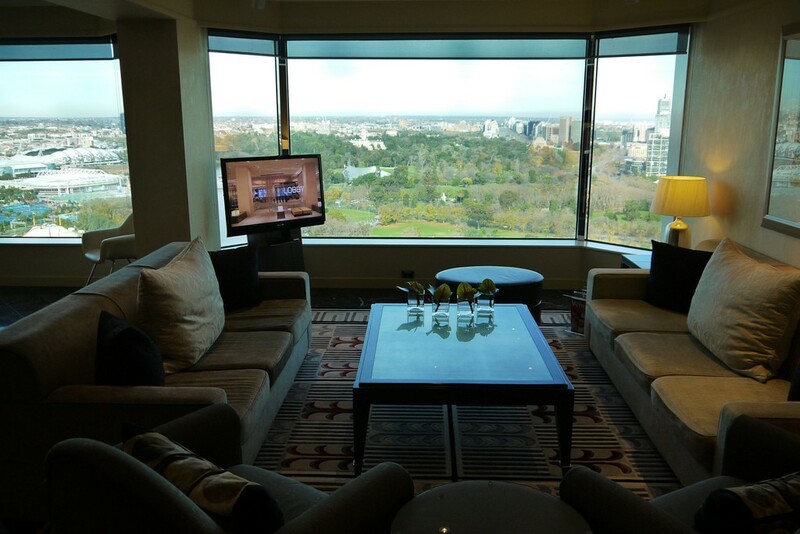 The Diplomatic suite is the highest room type. 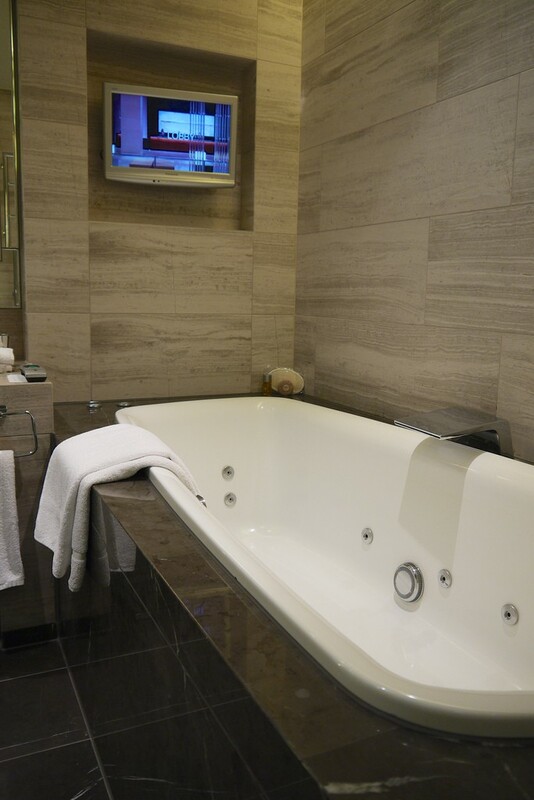 Worth noting – the twin spa baths in the bathroom. 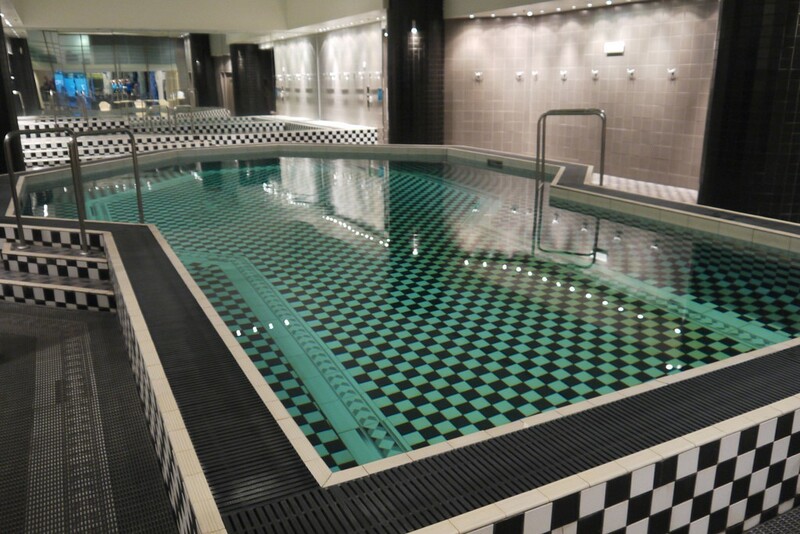 City Club Health & Fitness is a public gym in the Hyatt, and has a vast amount of equipment and indoor pool and spa. 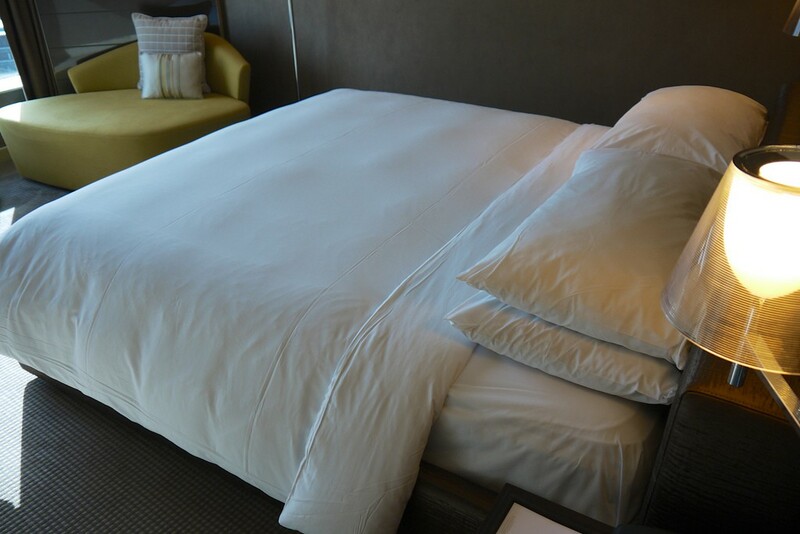 However, as a hotel guest you’ll have to share it with paying members. 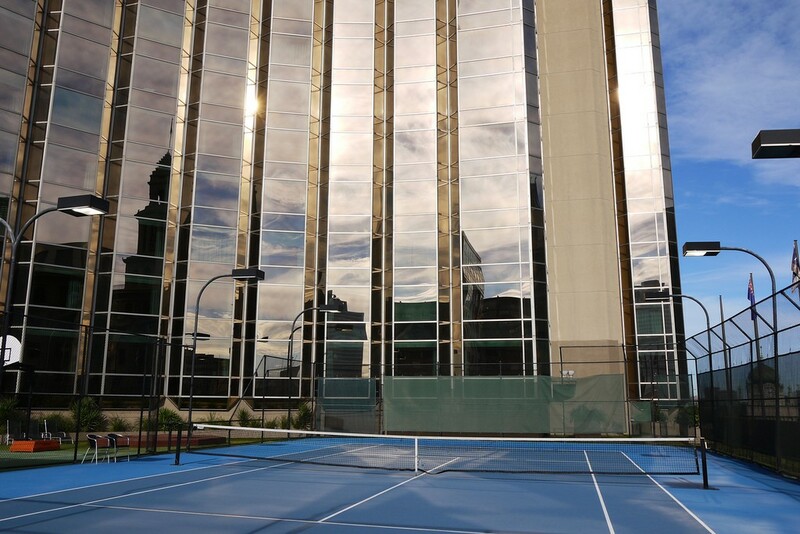 There’s also a tennis court and golf driving nets on an outdoor terrace under the hotel. 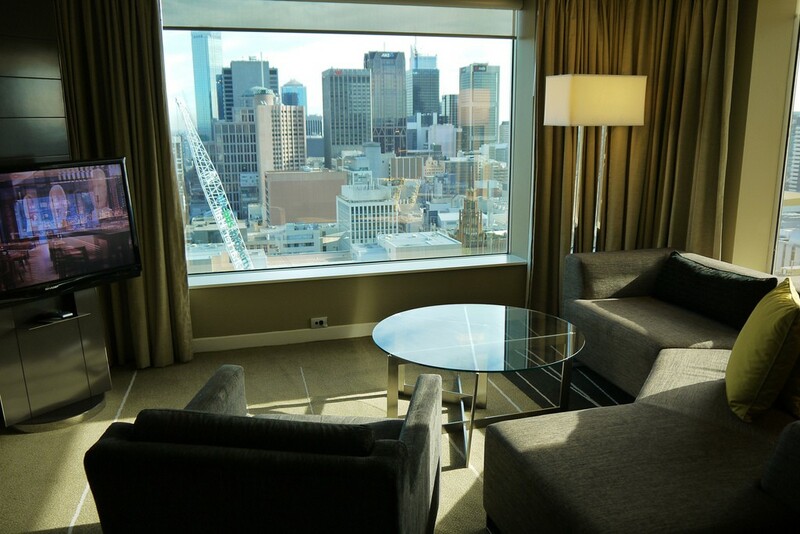 Given the hotel is an accommodation partner for the Australian Open, there has to be a fair chance some of the world’s best have knocked up here, right? 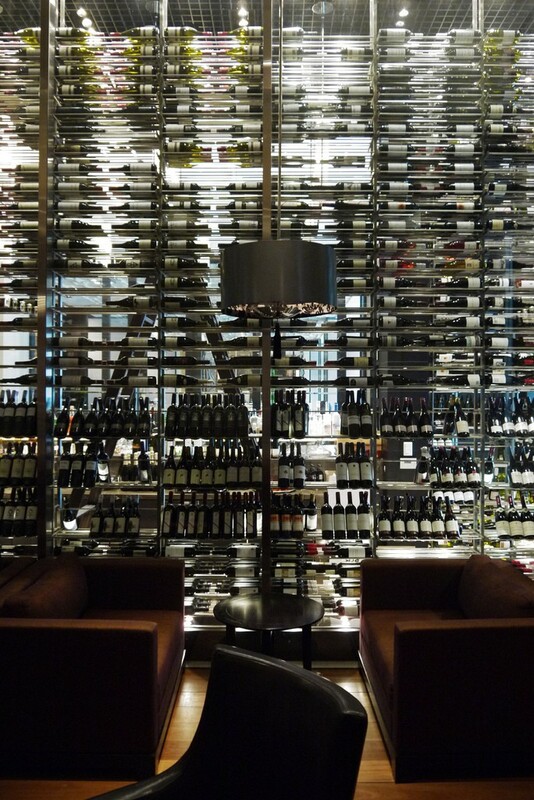 Even if not, it’s nice to dream. 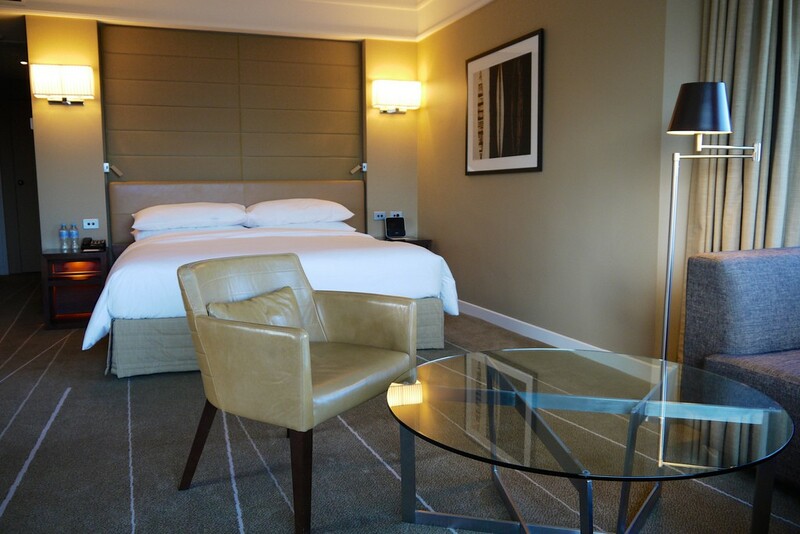 If you want to book a suite using Gold Passport points (either outright or as an upgrade), or you’re a Hyatt Diamond Gold Passport member, you can redeem one of your 4 suite upgrades to a Grand Suite King room, other suites aren’t eligible for certificate or points upgrades – although you might get lucky if you’re a Hyatt elite and score a further upgrade, who knows. 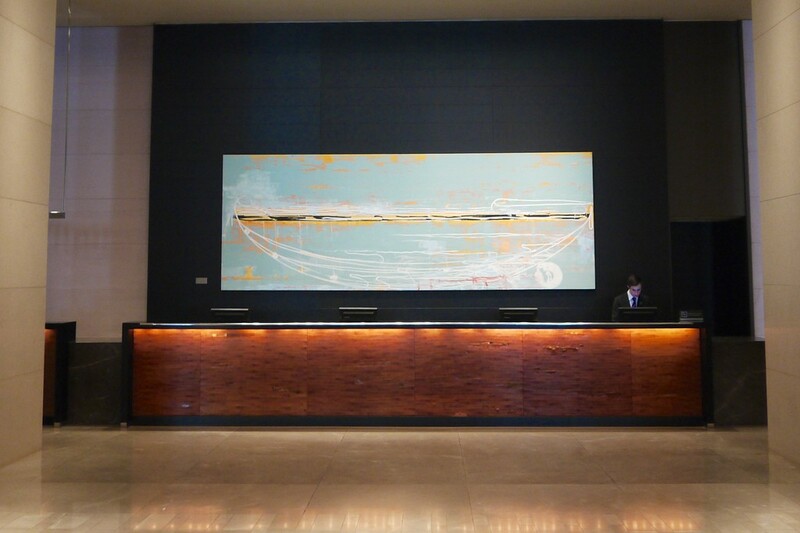 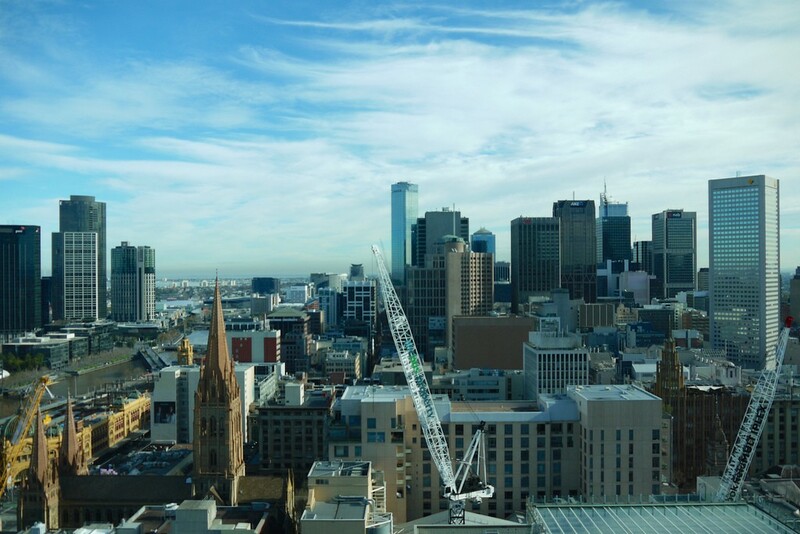 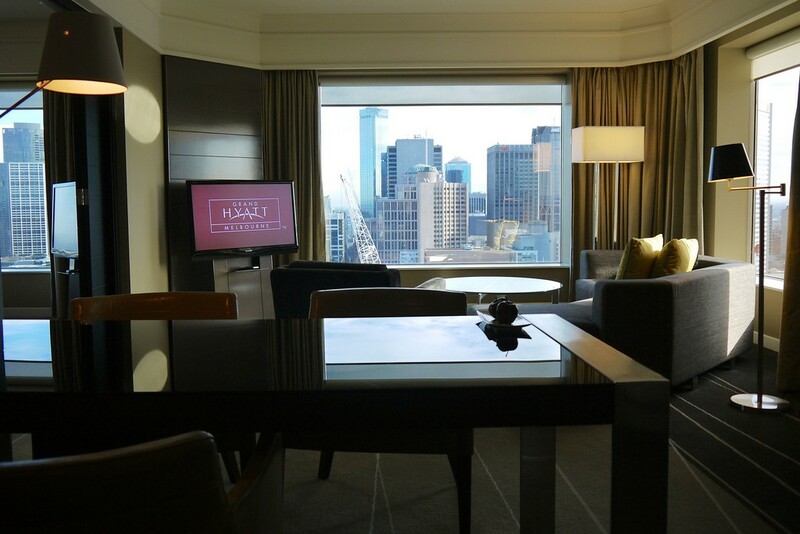 I’d love to stay at the Grand Hyatt next time in Melbourne – I hope my plans allow for it in the near future, and if they do, I’ll of course write up a review.